The month of November is declared pancreatic cancer awareness month, in a bid to increase public awareness of the lethal disease that killed Steve Jobs, the famous CEO of Apple. Only more awareness and understanding about this cancer can allow more people to be diagnosed early, in time for surgery, which is currently the only chance for a cure, albeit a remote chance. The pancreas, a 6 inches long organ, is located deep in the belly between the stomach and the backbone. The liver, intestine, and other organs surround the pancreas. The pancreas has exocrine and endocrine glands that secrete pancreatic juices, insulin, and hormones. Pancreatic juices, or enzymes, are made by the exocrine glands, and released into the intestines by ducts, to help digest fat, proteins, and carbohydrates. Exocrine glands and ducts make up over 95% of the pancreas. The endocrine cells, arranged in small clusters called islets of Langerhans, release insulin, and glucagon into the bloodstream. These manage the levels of sugar in the blood. When they malfunction, the result is often diabetes. Pancreatic cancer may affect the exocrine or endocrine functions of the pancreas. Tumors affecting the exocrine functions are the most common type of pancreatic cancer. Tumors that affect the endocrine functions of the pancreas are called islet cell tumors, and these are uncommon. Pancreatic cancer is one of the few cancers for which survival has not improved substantially over the past 40 years. Pancreatic cancer has the highest mortality rate of all major cancers. Ninety-three percent of pancreatic cancer patients die within the first five years of diagnosis. Only eight percent will survive more than five years. And only seventy-one percent of patients die within the first year of diagnosis. The average life expectancy of a patient, after the diagnosis with metastatic disease (cancer that has spread to other parts of the body) is just three to six months. Pancreatic cancer may only cause vague symptoms. Treatment options for pancreatic cancer are limited. Surgical removal of the cancer is possible in fewer than 20% of the patients. Chemotherapy or chemotherapy together with radiotherapy is an option given to patients whose cancers cannot be removed by operation. Surgery to remove pancreatic cancer is a long and complex operation that can be taxes both the surgeon and the patient. It often requires a long hospital stay, in part because of the long incision made in the belly. Pancreatic cancer is a leading cause of cancer mainly because there are no detection tools to diagnose the disease when surgery is still possible. Pancreatic cancer is sometimes called the ‘silent cancer’ because early pancreatic cancer often does not present symptoms until the disease is quite well advanced and spread to surrounding organs. Recent onset of diabetes and not associated with weight gain. Diabetes is due to a deficiency in insulin, which is produced by the pancreas from producing insulin leading to an onset of diabetes. If a person’s first-degree blood relatives had pancreatic cancer, his/her risk of is increased to two to three times. Long-term [chronic] inflammation of the pancreas [pancreatitis] is commonly linked to cancer of the pancreas. The risk of pancreatic cancer is even higher in people who have hereditary pancreatitis. Smoking significantly increases the risk of pancreatic cancer .In fact, it has been estimated that 20 to 30 per cent of pancreatic cancers are caused by cigarette smoking. Significantly, the risk of pancreatic cancer drops to normal in people who quit smoking. Simply put, cigarette smoking is the leading preventable cause of pancreatic cancer. Pancreatic cancer is more common in the African-American population than in the white population. 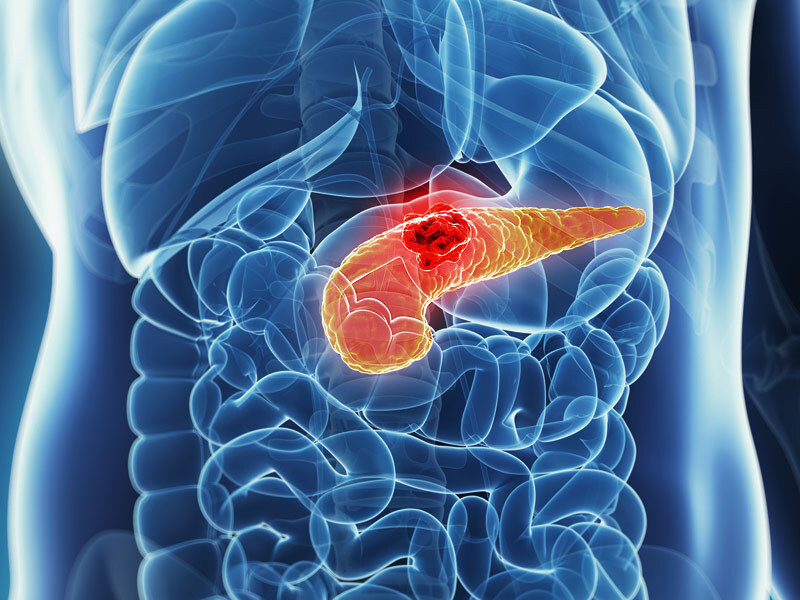 The risk of developing pancreatic cancer increases in proportion with age. Over 80% of pancreatic cancers develop between the ages of 60 and 80 years. Pancreatic cancer is found more commonly in men than in women. Diets high in red and processed meat, cholesterol, fried foods, and nitrosamines may increase the risk, while diets high in fruits and vegetables reduce it. Obesity significantly increases the risk of pancreatic cancer. Obese people have a 20 percent increase in risk of developing pancreatic cancer compared to people of normal weight. Carcinogens are a type of substances that are directly responsible for damaging DNA, promoting or aiding cancer. Certain pesticides, dyes, plastic, and chemicals used in metal refining are thought to be carcinogenic, and increase the risk of developing pancreatic cancer. When our bodies are exposed to carcinogens, free radicals are formed, and they try to steal electrons from other molecules in the body. Theses free radicals damage cells, affecting their ability to function normally. The result can be cancerous growths. Cirrhosis is the scarring of the liver. It develops in people who are heavy alcohol users, and who are affected by hepatitis. People with cirrhosis have an increased risk of pancreatic cancer. Infection of the stomach caused by the ulcer-causing bacteria Helicobacter pylori (H. pylori) may increase the risk of getting pancreatic cancer. Some research has suggested that existence of excess stomach acid in the stomach might also increase the risk. Previous PostEight secrets of the happiest and long-living people on earth: You could be one of them!Next PostWhat does ‘texting’ do to our children?